Reflexology was a tool used by Dusty during her recovery. She appreciated the simplicity of it. An affordable health care remedy, this can be learned and performed in the home. Anecdotally, reflexologists claim success in the treatment of a variety of conditions and injuries. One condition is fibromyalgia. People with this disease are encouraged to undergo reflexology therapy to alleviate any of a number of chronic bowel syndromes associated with the condition. Frequent brief sessions of reflexology therapy are also recommended as an alternative to drug therapy for controlling the muscle pain associated with fibromyalgia and for relieving difficult breathing caused by tightness in the muscles of the patient's neck and throat. In a typical reflexology treatment, the therapist and patient have a preliminary discussion prior to therapy, to enable the therapist to focus more accurately on the patient's specific complaints and to determine the appropriate pressure points for treatment. A reflexology session involves pressure treatment that is most commonly administered in foot therapy sessions of approximately 40–45 minutes in duration. The foot therapy may be followed by a brief 15-minute hand therapy session. No artificial devices or special equipment are associated with this therapy. The human hand is the primary tool used in reflexology. The therapist applies controlled pressure with the thumb and forefinger, generally working toward the heel of the foot or the outer palm of the hand. Most reflexologists apply pressure with their thumbs bent; however, some also use simple implements, such as the eraser end of a pencil. Reflexology therapy is not massage, and it is not a substitute for medical treatment. Reflexology is a complex system that identifies and addresses the mass of 7,000 nerve endings that are contained in the foot. Additional reflexology addresses the nerves that are located in the hand. This is a completely natural therapy that affords relief without the use of drugs. The Reflexology Association of America (RAA) formally discourages the use of oils or other preparations in performing this hands-on therapy. In order to realize maximum benefit from a reflexology session, the therapist as well as the patient should be situated so as to afford optimal comfort for both. Patients in general receive treatment in a reclining position, with the therapist positioned as necessary—to work on the bare feet, or alternately on the bare hands. A reflexology patient removes both shoes and socks in order to receive treatment. No other preparation is involved. No prescription drugs, creams, oils, or lotions are used on the skin. 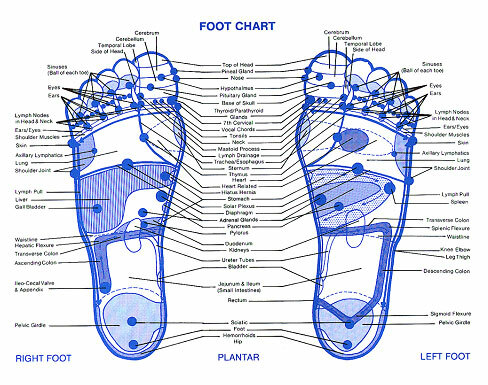 Because reflexology is intended to normalize the body functions, the therapy does not cause a condition to worsen. Most patients find that pain diminishes over the course of the therapy. It has been noted, however, that some patients experience greater discomfort in the second session than in the first session, because a significant easing of pain and tension is generally associated with the initial therapy session. As a result, when pressure is reapplied to the tender points of the foot during the second session, the sensitivity has been heightened. This increase in sensitivity may cause minor additional discomfort for the patient. Note: The above information is not intended for self-diagnosis or self-treatment. Please consult a qualified health care professional for assistance in applying the information listed.